Georg Büchner is one of the forefathers of modern theatre; his work foreshadowed both Naturalism and Expressionism. 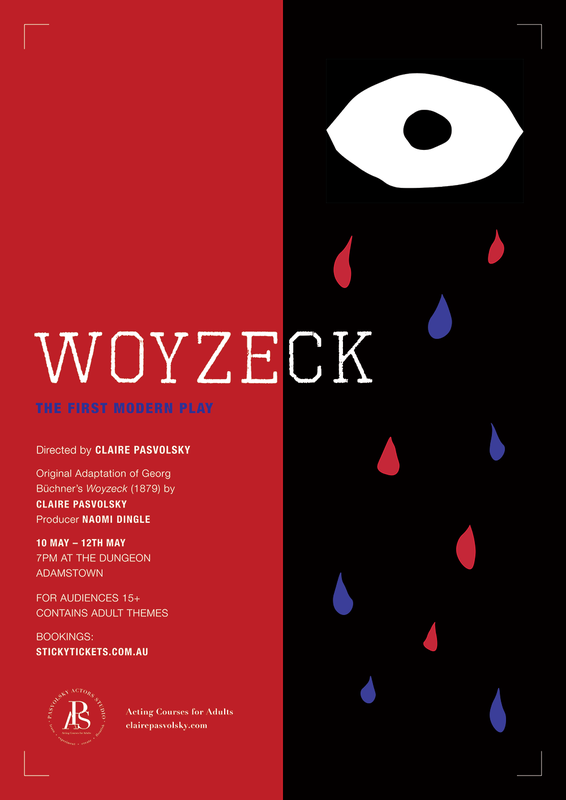 ‘Woyzeck’ is often considered to be the first modern play. It is the story of man’s descent into madness; the story of soldier driven mad by jealous frenzy and acute social deprivation – told in splintered dialogue and jagged episodes – which are as stunning today in a modern setting as they would have been when first performed in 1913. Pasvolsky Actors Studio aims to empower adult acting students through supportive and thorough training, as well as delivering inspiring performances to audiences. It is a professional space in which to learn, experiment, create and flourish. For audiences 15+ Contains Adult themes. Purchase tickets online at stickytickets. General admission $24.99 plus $1.50 booking fee. Doors open at 6:45PM. Seating is unallocated.